Marchesa’s Fall 2015 show took place at The St. Regis hotel in New York City, which is pretty much as luxe as it gets. The venue could not have been more perfect for The Great Gatsby-inspired hair and makeup looks created backstage by Antonio Corral Calero for Moroccanoil and Gucci Westman for Revlon. While Calero was primping supermodel Karolina Kurkova, one of the stylists on the team explained, “The look is inspired by the 1920s and 30s and is very glamorous. We did a faux bob, which was done by creating waves using a 3/4-inch curling iron and then tucking it under at the nape of the neck with bobby pins.” Models’ hair was parted to the side and the complementary makeup pulled together the vintage look perfectly. 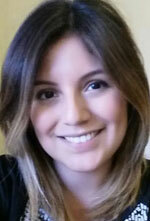 “I’m layering cream shadows with powder shadows to get a saturated, metallic color. And right before they go out, I’m putting a little gloss over that, so that it looks greasy and lived in,” explains Westman about the bold eye makeup. “It’s definitely a look. With this collection you need a whole look, otherwise it’s like walking outside without pants on,” she says. 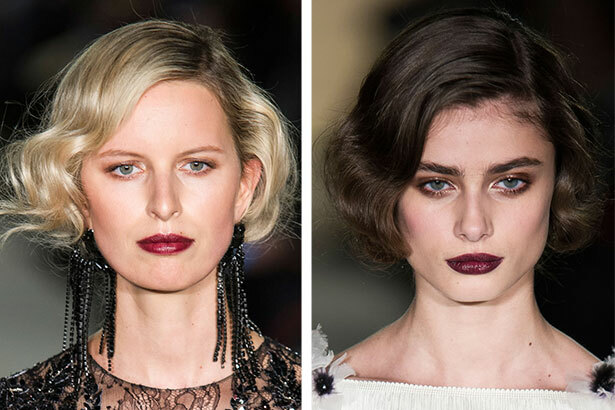 Westman gave models an equally statement-making lip using a chocolate-colored liner under Revlon Super Lustrous Creme Lipstick in Black Cherry.